One of the most painful realities of my transition has been the loss of my tribe. I was always proud of the Restoration Movement, and particularly its structure, a collection of independent churches working together for a common cause. Unfortunately, at this point in my life I would not be welcome in almost any Christian Church/Church of Christ, and I definitely would not be allowed to preach. Which is why Sunday, October 22 was so special. In 1879, First Christian Church of Portland came into being. In 1922 they finished a beautiful building in downtown Portland, Oregon. The building is now surrounded by apartment buildings and parking garages – literally. There is a large parking garage beneath the building and a luxury apartment building rises above it. The beautiful sanctuary and courtyard remain as they were decades ago. High on the sanctuary walls are stained glass windows reflecting the work of pioneers of the Restoration Movement. There are windows devoted to Thomas and Alexander Campbell, J.W. McGarvey, Isaac Errett, Barton W. Stone and others. All are beautiful in their intricacy. 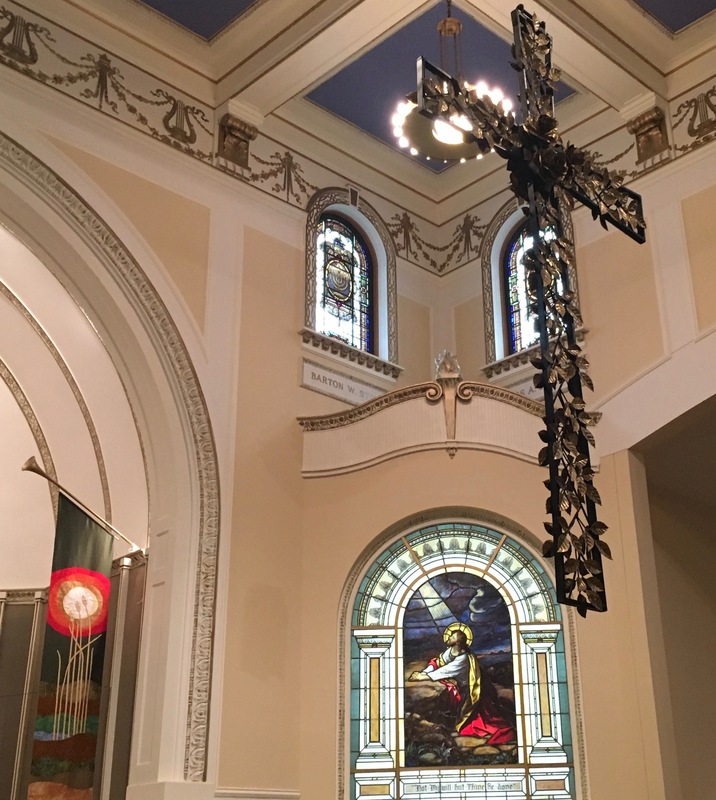 On Sunday morning, October 22, I preached at Christ’s Church Portland, a church affiliated with the Disciples of Christ sharing the building with First Christian. I stood in the sanctuary and preached the Gospel, bathed in light passing through those stained glass windows. I was overcome with emotion. Beneath the window commemorating Isaac Errett, I preached from the Book of Acts. In 1866, Isaac Errett founded Christian Standard magazine. From 2003 to 2013, I was a weekly columnist and editor-at-large at CS. And there I was, Paula, boldly preaching the Gospel. We have no idea with whom the early leaders of the Restoration Movement would align themselves if they were alive today. Maybe they would be partial to the Churches of Christ, the most conservative branch of the movement. Possibly they would find a home in my former branch, the independent Christian churches. Or they might be most comfortable in the Disciples of Christ, the current affiliation of First Christian Church and Christ’s Church Portland. We have so much more knowledge than was known in the early 1800s. We can only guess how that accumulation of knowledge would have affected the theology of those early leaders. I know how much my increase in knowledge has changed my theology over the past 40 years. I do know how it felt when, during my sermon, I pointed to Isaac Errett’s name and referred to my work with Christian Standard, and pointed to Barton W. Stone’s name, and noted my middle name, Stone, and my affiliation with the movement he started. It was grounding. There is an entire branch of the Restoration Movement, made up of hundreds of thousands of members, that welcomes me with open arms. Sunday, October 22 brought redemption. I am not an orphan. I do have a heritage, and I have been firmly embraced by people who look fondly on the names I have known since childhood. What goes around, comes around, with reconciliation in its arms. I can’t imagine what a great experience this must have been. That is awesome! What an amazing experience. I love it! That has been my “tribe” (Independent Christian Churches and Disciples of Christ) all my life. I love the heritage and am saddened by much also. I was raised in and ordained in a very biblically conservative Disciples of Christ church in Lincoln, Nebraska. I was educated at Nebraska Christian College, an independent Restoration college; then in Norfolk, Nebraska; now in Papillion, Nebraska, a suburb of Omaha. I preached in both Disciple and Independent churches most of my ministry, and in recent years have not limited my proclamation of the gospel to just one “tribe”! I now attend and am active at College Park Church in Indianapolis, Indiana. It began as a Baptist church but after a few years became independent, My heritage is a mixture~ I suspect that is true of most. But I am grateful for the heritage I claim as mine! Jim, I still have an affinity for every branch of the movement. At their healthiest, all three are laudable. But alas, they are human institutions. So, in many ways you have come home as the Prodigal Daughter. Very wonderful!! What a powerful experience. I am so glad you had this opportunity. Thanks so much Kimberly. It was wonderful!